These adorable bite-size snacks are loaded with flavor (and 1.5 cups of fruit in every bag). We picked premium Fuji apples and raspberries at their peak ripeness, diced 'em up into tiny pieces, then freeze-dried them into cute crunchy clusters. And voila! 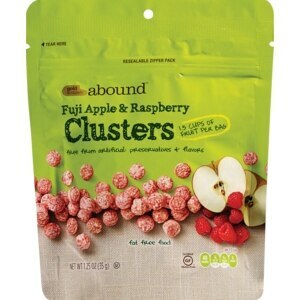 Our super snackable Fuji Apple & Raspberry Clusters were born. Naturally sweet, you'll feel guilt free as you reach for more... and more. At Gold Emblem Abound, we believe a healthy life should be a tasty life. That's why we carefully source nutritious ingredients that satisfy your cravings, but never give up great taste. We make choosing nourishing snacks simple. Because with us, wholesome choices abound.